Mid-January, 5pm and still light out. This is the view to the west, with the big barn just out of frame to the left, looking past the loafing barn yard to the second, 11-acre pasture—the 9-acre field where the market garden lives is directly to the right—and then the trees. At the end of the rail fence in the foreground is the gate where the cows come home at night. 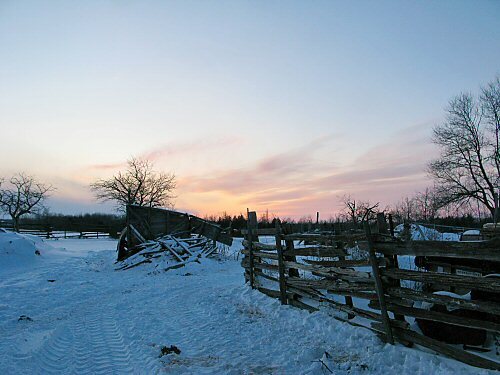 It’s bitterly cold, my fingers are going numb after only a couple of minutes on the camera, but I’m enjoying the sunset, out here in the deep freeze, thinking about all the work ahead for the new-farm market garden season. It’s crazy. Cool! I nearly jumped for joy in my office yesterday when I saw that the sun was just setting at 5:15. It was a beautiful red/gold sunset with some purple clouds in the distance. The sight, and your picture that you shared, gives me hope for the coming months – I can’t wait until that day in mid February when the light suddenly changes somehow – feels totally different. A beautiful view of the winter sky. Its wonderful how bleak cold fields contrast with our memories and plans of the same scene in the warm seasons. Looks like a great place you have there. That picture gives me such a sense of peace….